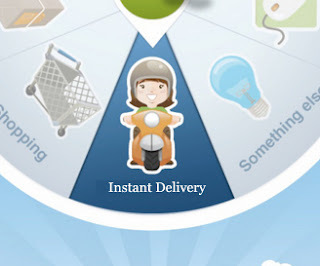 If you have searched for string "I need someone to run my errands in Hyderabad", you should contact GigBee- Hyderabad. NRI's/ Expat often wonder how to get the simplest tasks done in Hyderabad when they are away. These tasks range from servicing their official documents like birth certificates, PAN numbers, degree certificates or retrieving their transcripts from college, visiting Doctor, taking care of their Parents etc. When such a need arises we search for contacts in India like friends, relatives and requests them to run these errands. Capitalizing on this niche need of the NRI's/ Expat, GigBee NRI service is a unique service that addresses such needs. If patient is abroad, discussing medical report with the Doctor, and sending back the report to patient. Get Stitching done on behalf of our client and sending through courier. Sending courier to abroad on behalf of client for any specific item like sweets, gift items etc. Brighten up our customer’s nearest one with a bunch of flowers. Monthly House cleaning of NRI’s Houses, personal visit to house and sending the status like picture and other required details. And many more, you can always write us and discuss your specific requirement. So far, we have served more than 100 satisfied clients staying in the USA, UAE and Singapore etc, we are currently operating only in Hyderabad but in the near future we will also be working in other metros. You can write us at info@gigbee.in or visit www.gigbee.in. If you don't know where to start, take a look at these cleaning tips to help tackle a top-to-toe clean like a pro. For many of us, cleaning isn't our favorite job in the house. One way to deal with it is simply to tackle it head on and start with the biggest and most difficult jobs first. Ticking it off your to-do list will be a great feeling, and things will feel much easier from there. Roll up your sleeves and clean out the oven, scrub the fridge and clean the windows. Smaller jobs like dusting and wiping down surfaces can be spread out over the week whenever you have time, but these large jobs can be tackled in one fell swoop for an instant clean feeling. Some commercial cleaning products are packed full of chemicals and additives that can be harmful to both your health and the environment. Where possible, reduce the need to buy chemical products and reach for those already sitting in your kitchen. Everyday products such as baking soda, vinegar, lemon and cornstarch can be used in place of chemical-laden commercial products, and for a fraction of the cost. 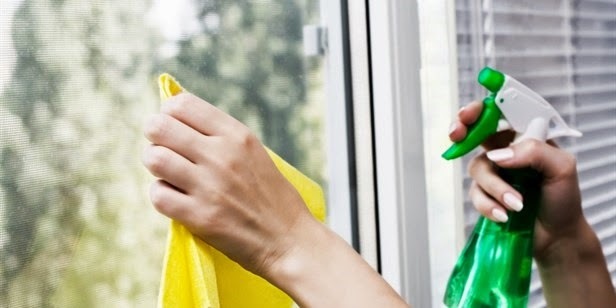 Vinegar and warm water makes for an effective window and mirror cleaner, wiped down with a piece of newspaper, while a paste of baking soda and water makes for a great stove or sink scourer. No spring clean is complete without a careful plan detailing exactly what you want to do. Set yourself goals and check off things you've already done. Lists are also great if you're dividing the clean between several people. Assign different jobs to each person and get them to mark off what's complete, ensuring there are no double ups. r the other.) If your sink is stainless steel, make it sparkle afterward by putting a few drops of mineral oil on a soft cloth and buffing. This prevents water buildup, which deters mold and keeps the sink looking clean longer. Do Dishwasher Duty:: Once a week, shake baking soda on a damp sponge and wipe around the machine’s edges to remove stuck-on food or stains. To clean the inside, run an empty cycle with Dishwasher Magic, a product designed to kill bacteria like E.coli. “During cold and flu season, add a quarter-cup of bleach to the regular dish cycle to kill bacteria,” says Gigbee. 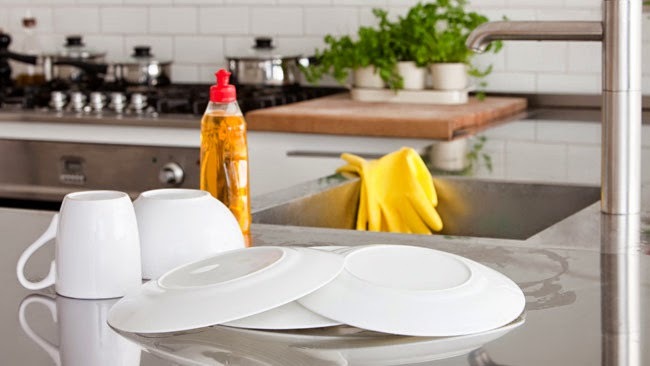 The dishes will be safe and sanitized after the rinse cycle is finished. Love Your Oven: Keep the heart of your kitchen clean by lining the bottom with a nonstick ovenliner. It can be wiped with a paper towel, put in the dishwasher, and reused over and over. Disinfect the Disposal: To get rid of odors, drop in a cut-up lemon, some salt and a few ice cubes. The lemon deodorizes, and the ice and salt clean away residue. Or try Disposer Care (gigbee.in), which is specifically designed for the job. Crumple Paper Towels…Forever: Use microfiber cloths instead. When wet, they sanitize and clean floors, counters, glass and tile, and eliminate the need for other cleaning products. They’re reusable (machine-wash, hang to dry) and cost about 50 Rs for a two-pack. Clean as You Go: Gigbee suggests filling your sink with hot soapy water as you start dinner. “Place used dishes and pans in the filled sink so they’ll be soaking while you eat,” she says. Also, wipe up any spills immediately—don’t give sauces, oils or spices a chance to sit around. Tame the Toilet: Drop a teaspoon of Tang Drink Mix in the bowl. The citric acid acts like a scrubber…and it’s nontoxic, in case the dog takes a sip. Let it sit for a few minutes, then swish and flush. And if you cringe at the idea of getting splashed by toilet water (ugh! ), Gigbee suggests pushing the toilet brush in and out of the trap before you begin. This lowers the water level, allowing you to safely swish away. Corral Strays: Keep drains free of hair and clogs by using a product like Drano or Liquid-Plumr to make sure potential clogs are gone, then pour boiling water down drains once a week to keep problem-free. 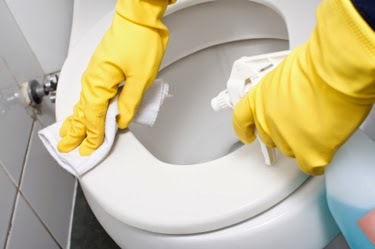 Get rid of those annoying stray hairs on the floor by sweeping them up with a damp of toilet every morning.